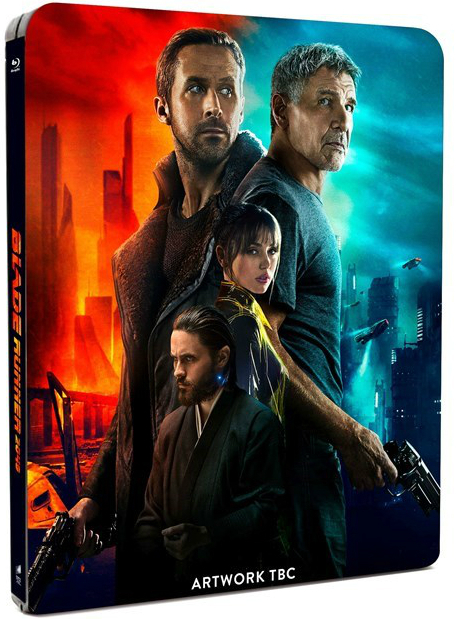 Sadly, the long-awaited ‘Blade Runner 2049’ appears to be following in its predecessor’s footsteps and will be a box office bust in theaters. Much like the original, however, it’s sure to be a cult item on video. 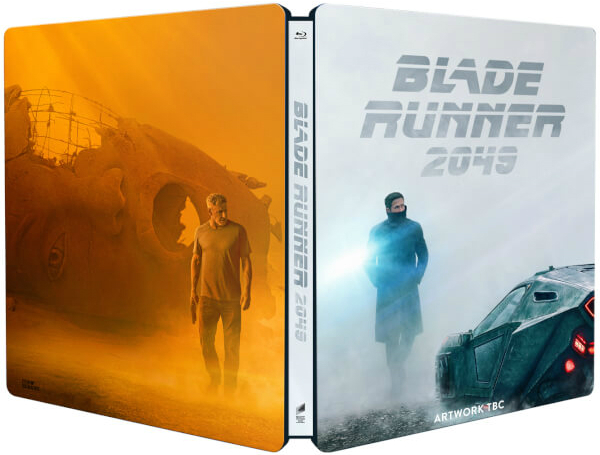 SteelBooks and other fancy editions are already announced. 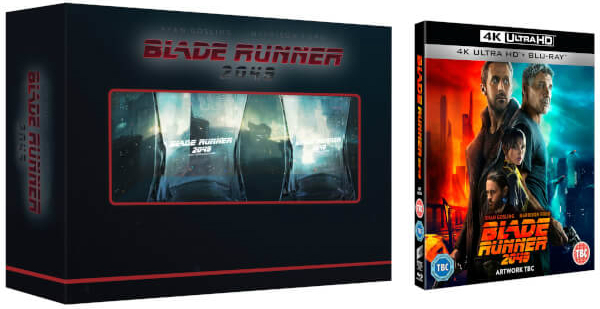 Although I feel fairly confident that a SteelBook will also be released domestically, the first available for preorder comes from the UK. (Note that Sony handles international distribution for the film, whereas Warner Bros. has it in North America.) The artwork pictured looks OK. Perhaps a little bland, but at least it’s not a Pop Art travesty. Not yet, anyway. The image is clearly labeled TBC and may very well change before release. Zavvi has already sold out on this item. 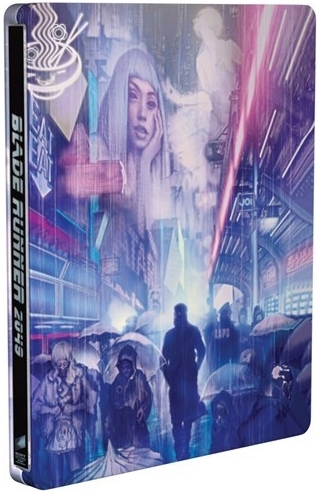 If you’re a fan or SteelBook collector, you should probably scoop this up from Amazon UK as soon as possible. Speaking of Pop Art travesties, the notorious Mondo collective has been commissioned to provide an exclusive SteelBook to HMV. The temp art currently displayed on the listing page is obviously not final, as it’s not nearly Pop Art-y enough and doesn’t look like Mondo at all. Expect the actual product to look like a half-completed coloring book page. Update: Here’s the final art. It’s fortunately not in coloring book style and is actually fairly tame by Mondo standards, but I still don’t particularly care for it. This one is just silly. Sony has shoved a copy of the Ultra HD Blu-ray into an oversized box with some branded shot glasses. While, yes, Harrison Ford is seen drinking whiskey in the movie, that’s hardly a critical plot detail. The product is listed as being unavailable or sold out, but I’m not sure if that perhaps means it simply hasn’t opened up for orders yet. I can’t imagine it being a huge seller. 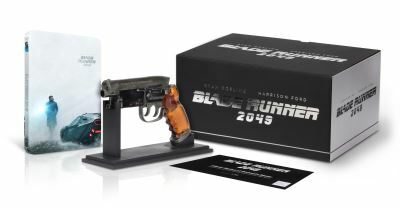 As noted by reader JudasCradle in the Comments, French retailer FNAC will bundle a SteelBook (identical to the UK version) into a box with a replica of a gun used in the film. It appears to be sold out. Even if it weren’t, I imagine someone in the U.S. trying to import it might have some trouble getting it through Customs. I guess the shot glasses are more practical swag than a wooden horsey and easier to manufacture than a holographic life partner. Just saying, one week is: all-I-can-see-is-breasts and that’s not right! Righteous, wagging my finger, shaking my head. And another week is: I’d pay for more drooling-face-emoji fully-interactive hologram, if you know what I mean, wink wink, growl growl, howl at the moon. Just noticing what I read. 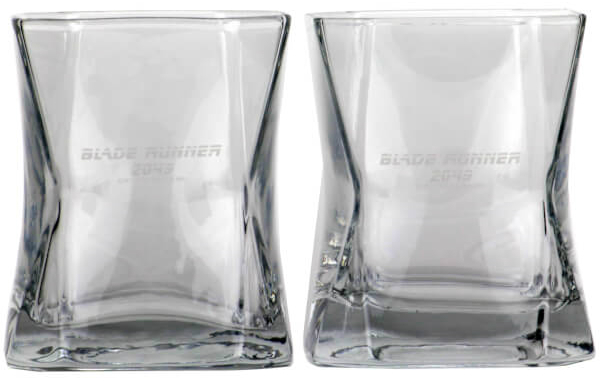 When I got the e-mail from Zavvi, it said they had very limited number of the UHD Shotglass edition. Not the biggest fan of any of them tbh… Hopefully the BB exclusive SB comes with more attractive artwork. Now all we neex is a release date. I’m guessing January 2018? Indeed, the shot glasses version was available for preorder a few days ago. So, uhm, perhaps it DID sell out? Imagine that. 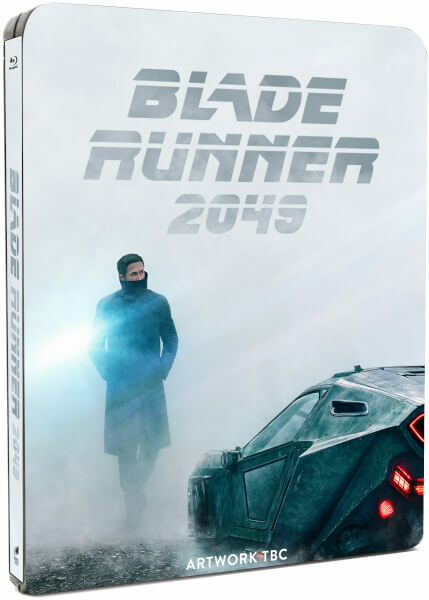 Not a fan of steel books but I am definitely buying the UHD. There’s an edition (overseas, not sure what country) with a replica gun. That one looks great. Post has been updated with that edition. Thanks. Josh, not a Steelbook, but are you going to write about Stranger Things’ faux VHS edition? I’m still looking for confirmation that it’s real. I’ve seen no studio announcement and the Target web site doesn’t have a listing for it. It seems really unusual that a notable title like that would be released with no advanced notice, exclusively as an in-store retailer exclusive in gimmicky packaging with no standard edition available anywhere else. Maybe that’s really happening, but it’s damned peculiar. Perhaps it’s a really good hoax. But the leaked pics says to me, it’s happening. About the faux VHS edition, Stranger Things have happened. Yes, it was confirmed today. It will be mentioned in Monday’s Blu-ray Highlights post. That’s a new addition to the listing. The page did not previously mention 3D. I will update this post. Thanks.